McCain Vows To Reach Across Party Lines It was John McCain's night to shine Thursday at the Republican National Convention in St. Paul, Minn. In accepting the party's presidential nomination, McCain promised to work against constant partisan rancor and reach across party lines. McCain and his running mate, Sarah Palin, aren't wasting any time and began the day campaigning in Wisconsin. It was John McCain's night to shine Thursday at the Republican National Convention in St. Paul, Minn. In accepting the party's presidential nomination, McCain promised to work against constant partisan rancor and reach across party lines. McCain and his running mate, Sarah Palin, aren't wasting any time and began the day campaigning in Wisconsin. John McCain ended the Republican Convention with a gentler speech than the ones that preceded it. He promised that as president he would take the best ideas for the country, even if they came from Democrats. NPR's Scott Horsley reports. SCOTT HORSLEY: Even as he accepted the Republican nomination for the White House, John McCain showed the independent streak that's long worried some of his party's faithful. McCain called for an end to the partisan rancor that keeps politicians in Washington from solving problems and said he would ask Democrats and Independents to serve in a McCain administration. Sen. MCCAIN: …this amazing country can do anything we put our minds to. HORSLEY: McCain said he has a record of just that kind of bipartisan leadership and that Democratic rival Barack Obama does not. McCain promised to campaign hard against Obama in the two months before the November election, but he also said he admires the Illinois senator and his supporters. Sen. MCCAIN: Despite our differences, much more unites us than divides us. We are fellow Americans, and that's an association that means more to me than any other. HORSLEY: McCain also gave a fleeting nod to President Bush, without actually mentioning his name, for leading the country after September 11th and for preventing another attack. The Arizona senator was interrupted several times by hecklers, who were generally shouted down with chants of USA. McCain described himself as a maverick who's willing to challenge special interests, whether they're defense contractors, tobacco companies or even fellow Republicans. In an election year when the Republican brand has been badly tarnished, McCain said the problem is not the party's long-held principles, but Republican leaders who haven't lived up to them. Sen. MCCAIN: We were elected to change Washington and we let Washington change us. We lost the trust of the American people when some Republicans gave in to the temptations of corruption. We lost their trust when rather than reform government, both parties made it bigger. HORSLEY: McCain's specific policy proposals came mostly from the standard Republican hymnal - lower taxes, more limited government, school choice and federal judges who strictly interpret the Constitution. One of his biggest applause lines came when he called for an ambitious national effort to wean the country off imported oil. Sen. MCCAIN: We'll attack the problem on every front. We'll produce more energy at home. We will drill new wells offshore and we'll drill them now. We'll drill them now. HORSLEY: McCain's speech last night was neither as partisan nor as passionate as Alaska Governor Sarah Palin's had been the night before. But if McCain was overshadowed by his new running mate, that was just fine with him. Sen. MCCAIN: I'm very proud to have introduced our next vice president to the country but I can't wait until I introduce her to Washington. HORSLEY: McCain closed by retelling the story of his five-and-a-half years as a POW in Vietnam, which was a central theme throughout the GOP convention. It was while in captivity abroad, McCain said, that he fell in love with his own country. Sen. MCCAIN: I loved it because it was not just a place but an idea, a cause worth fighting for. I was never the same again. I wasn't my own man any more, I was my country's. HORSLEY: McCain says that's when he learned the satisfaction of serving a cause greater than himself, and he urged those who were listening to serve his cause in the next two months. Scott Horsley, NPR News, with the McCain campaign in Milwaukee. 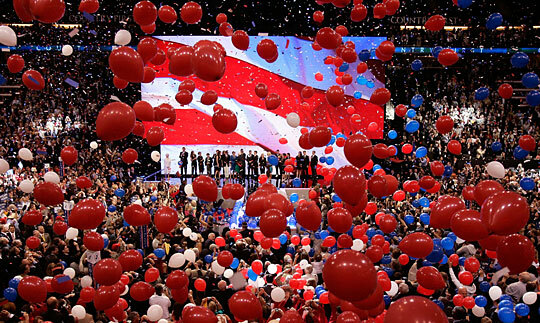 McCain and Palin stand on the stage with their families while red, white and blue balloons were dropped after McCain gave his acceptance speech. Cindy McCain tells the delegates at the GOP convention that her husband, John McCain, is a "source of inspiration" who has "shown the value of self-sacrifice." 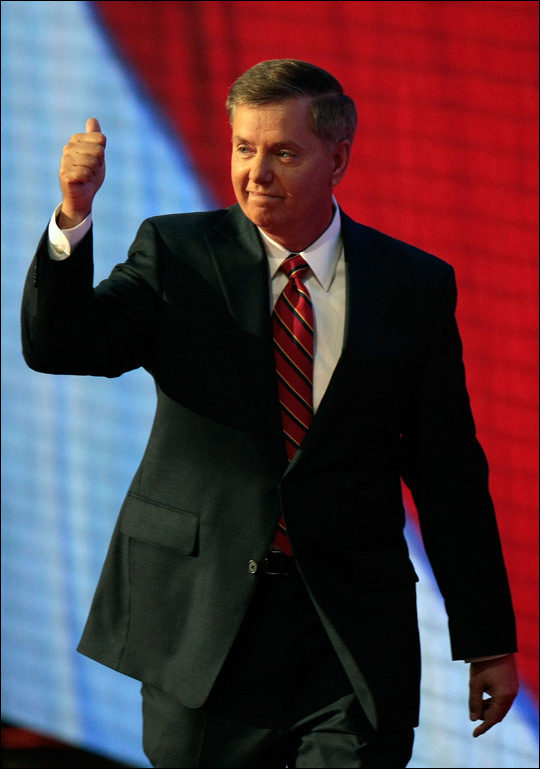 South Carolina Sen. Lindsey Graham said his speech was "for the troops." He criticized Obama for opposing the so-called troop surge in Iraq, saying that the strategy had succeeded in quelling the violence there. 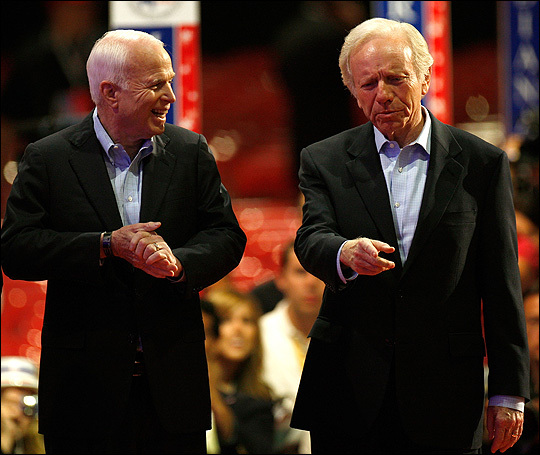 McCain inspects the setup for Thursday's speech with former Democrat Joe Lieberman, who spoke on behalf of McCain earlier at the Republican National Convention. 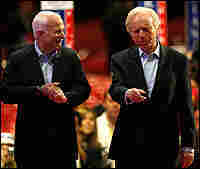 John McCain promised "change is coming" to Washington and accepted the Republican presidential nomination Thursday night. The speech kicked off a fall campaign between two candidates who both pledge to upend the status quo in what may well remain a closely divided race until Election Day. 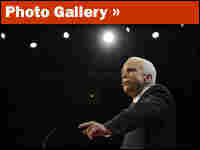 McCain's speech lacked the searing attacks against Barack Obama that characterized running mate Sarah Palin's address Wednesday night. Instead, McCain said he "wouldn't be an American worthy of the name if I didn't honor Sen. Obama and his supporters for their achievement. "But," McCain added, "let there be no doubt, my friends: We're going to win this election." McCain sought to draw contrasts between himself and the Democratic presidential nominee, saying that "again and again," he has "worked with members of both parties to fix problems that need to be fixed." "That's how I will govern as president," he said. "I will reach out my hand to anyone to help me get this country moving again. I have that record and the scars to prove it. Sen. Obama does not." McCain praised Palin, who was formally nominated by acclamation Thursday night, saying, "I found just the right partner to help me shake up Washington, D.C."
He added that he "can't wait" to introduce her to Washington. "And let me offer an advance warning to the old big spending, do nothing, me first, country second Washington crowd," McCain said. "Change is coming." Rising Above 'Constant Partisan Rancor'? The attacks on Obama from Palin and other Republican speakers the previous night still buzzed through the convention Thursday and seemed at odds with McCain's call to rise above "the constant partisan rancor," which he said was "a symptom. It's what happens when people go to Washington to work for themselves and not you." Obama himself responded to the GOP attacks during a campaign stop Thursday. He said Republicans were avoiding addressing issues such as the economy that voters care about. "You're hearing an awful lot about me — most of which is not true — but you're not hearing a lot about you," Obama said. Speaking in a convention hall plastered with McCain's slogan, "country first," the GOP nominee spoke of his devotion to America, referring to his own compelling story as a prisoner of war for 5 1/2 years in Vietnam. "I fell in love with my country when I was a prisoner in someone else's," he said. "I loved it because it was not just a place, but an idea, a cause worth fighting for. I was never the same again. I wasn't my own man anymore. I was my country's." McCain repeatedly referred to his reputation as a maverick. In an effort to reach out to Democrats and independents, he said he doesn't work for a party. "I don't work for a special interest," McCain said. "I don't work for myself. I work for you. I've fought corruption, and it didn't matter if the culprits were Democrats or Republicans." Referring to his support of campaign finance overhaul, McCain said he "fought to get million-dollar checks out of our elections." He said he has "fought lobbyists who stole from Indian tribes," "fought crooked deals in the Pentagon" and "fought tobacco companies and trial lawyers, drug companies and union bosses." McCain's willingness to fight was a recurring theme throughout the speech. He said he "fought for the right strategy and more troops in Iraq, when it wasn't a popular thing to do." Praising Gen. David Petraeus and "the brave men and women he has the honor to command," McCain said the troop surge he advocated "succeeded and rescued us from a defeat that would have demoralized our military, risked a wider war and threatened the security of all Americans." Countering Democratic charges that he was out of touch with people facing economic struggles, McCain said, "I know some of you have been left behind in the changing economy, and it often seems your government hasn't even noticed. Government assistance for unemployed workers was designed for the economy of the 1950s. That's going to change on my watch. "My opponent promises to bring back old jobs by wishing away the global economy. We're going to help workers who've lost a job that won't come back find a new one that won't go away." He also pledged to embark on the most "ambitious national project in decades" to increase domestic energy production. McCain said the U.S. will drill new oil wells "offshore, and we'll drill them now." That elicited a chant of "Drill! Drill! Drill!" from the delegates. Stressing his foreign policy credentials, McCain said he knows "how to work with leaders who share our dreams of a freer, safer and more prosperous world, and how to stand up to those who don't. I know how to secure the peace." Early in his speech, McCain was interrupted by protesters, who were dragged from the arena as the crowd chanted "USA." Preceding McCain to the podium was his wife, Cindy, who came onstage with her children. She called her husband the "best father you could ever imagine." She said, "It's going to take someone of unusual strength and character — someone exactly like my husband — to lead us through the reefs and currents that lie ahead. I know John. You can trust his hand at the wheel." She added that she "always thought it's a good idea to have a woman's hand on the wheel as well," leading cheers for Alaska Gov. Palin. In contrast to Obama's acceptance speech, delivered before some 84,000 people at Denver's football stadium, McCain's speech was a somewhat more intimate affair, and there were vacant seats inside the Xcel Energy Center. The speech was delayed until the end of the NFL's season-opening football game. Along with the McCains, delegates heard from former Pennsylvania Gov. Tom Ridge and Republican Sen. Lindsey Graham of South Carolina. Ridge said he was speaking "about a warrior who has sometimes stood alone, and always shown the way, in fighting for the most vulnerable of our citizens, for the country he so dearly loves and for the founding principles we all so deeply cherish." Ridge, who was considered to be on McCain's vice presidential short list, said, "Where some people see adversity, John McCain accepts a challenge. Where some people see a crisis, John McCain creates an opportunity. Where some people see defeat, John McCain insists on victory. John knows the purpose of elections is not merely to win. You run to win ... but you win to govern." Graham said his speech was "for the troops." He criticized Obama for opposing the so-called troop surge in Iraq, saying that the strategy had succeeded in quelling the violence there. For the 72-year-old McCain, who would be the oldest first-term president ever elected, accepting the nomination Thursday marked the latest step in an at times improbable journey. It is his second run for the nation's highest office. In 2000, he lost the nomination to now-President George W. Bush, who was briefly referred to — but not by name — in his speech Thursday. Last summer it seemed as if McCain's second run would end badly, with a campaign that was virtually broke. 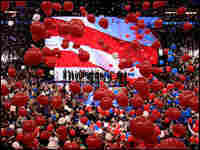 But Thursday night, McCain stood among a massive drop of red, white and blue balloons, and all that seemed far in the past. Friday, McCain and Palin head out for campaign stops in the suburbs of Milwaukee and Detroit.